The correct medical term for a break to a bone is a fracture. Bones can be fractured by direct impact, crushing, bending, bullet wounds and many other causes. There are many different types of fracture depending on how the bones have been affected. In simple pet first aid terms, you are not necessarily going to know what has been fractured or even if it is actually fractured. You may identify a fracture based on the mechanism of injury which is how the accident occurred or the signs you see. The key difference in treatment will depend if the bones have punctured the skin. In this case, you will need to stop the bleeding to avoid shock as the blood levels reduce. Shock will be a problem with any fracture as fluids are lost to the injury site in the form of swelling regardless of whether the skin is broken. The least serious type of fracture is a greenstick fracture. This is where one side of the bone is fractured but the other side is intact or bent. With this type of fracture, they may still be able to walk on the limb, although with care. The only way you will know if it is a greenstick fracture is with an x-ray. There is a bit of controversy regarding the treatment of a fracture on an animal. 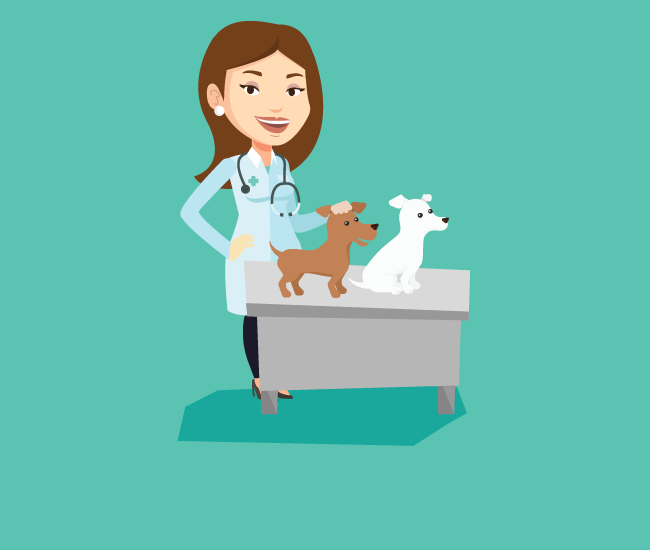 What is agreed is that if they have a fracture or if you suspect a fracture, you must seek veterinary help as soon as possible. The question is do you apply a splint to a fractured leg? The problem is that if a splint is put on the leg there is a high chance that you will move the fracture and you could do more damage or rupture a blood vessel. As a general rule, if you can get them to a vet quickly and safety, lay them down and transport to the vet. Animals are very good at holding an injured limb off the ground and walking on three legs so you may find they can walk if you are unable to carry them or if carrying them puts extra strain on the fracture. If this is going to be a long journey or a long period of time, you may consider splinting. The important thing with a splint is not to move the fracture. A splint can be made using a magazine or bubble wrap over the break to give it support. If you use a magazine, you can pad it to give a softer support. It is best to call a vet to get their advice before you splint and we would only consider splinting a leg and not the ribs, spine or pelvis. 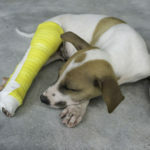 Vets will administer different types of treatment like placing the limb in a cast for up to 6 to 16 weeks depending on the injury and they usually go on to a full recovery. Younger animals heal more quickly than older animals so the treatment will depend on the age of the animal.